Hmmm. So this woman converted to Islam, but had no clue what Islam teaches about women? Then, after converting, she was surprised to learn that women are treated differently in Islam? Now she's disillusioned by what she's learned about Islam after converting? And she's also learned enough about Islam to know that she had better keep her real name secret? NEW YORK (WOMENSENEWS)—When Matea converted to Islam in December 2013 she looked forward to joining the life of her local mosques here. Today Matea, like many Muslim women, is disillusioned. "When I first converted I wanted to be part of the mosque environment. But I went to mosques and what I found was sort of an unwelcome environment for women," she told Women's eNews during a discussion organized last week by Women in Islam, a New York-based organization working to empower Muslim women through knowledge and practice of Islam. Matea didn't want her full name published. "The spaces are separated, there are different rooms and sometimes it was even in the basement," Matea continued. "And as a convert, it feels very strange to you. I used to go to church and everybody is part of the same community. You can see the preacher. You can hear the sermon very well." Momentum is building to improve Muslim women's prayer spaces inside mosques. Last year, Hind Makki, a resident of Chicago who describes herself as an interfaith educator and community activist, launched the Side Entrance project on Tumblr and Facebook, inviting people from around the world to share photos of the mosques they attend and show the differences between male and female prayer areas. "We show the beautiful, the adequate and the pathetic," says the Side Entrance's introduction on Tumblr. Makki hopes the Side Entrance website will help more Muslim men realize the terrible state of Muslim women's prayer spaces and encourage them to join the women's call for action and change. In an email interview, Makki said the key to improving women's treatment at mosques is to hold a broad discussion that includes religious leaders, mosque architects and lay Muslims. Just checked in on Yahya Snow's blog. He has the usual rants against "Islamaphobes", but in his zeal to attack all thinks truthful he admits that Muslims do NOT think much if at all about woman. Before he praises the work of "Side Entrance" something he would condemn as Islamaphobic if a Christian or Jew was working with the group. He makes the following excuses for the plight of the female worshipers of allah. "One of the issues mosques in the West face is that many were set up by Muslim immigrant communities where due to a lack of space and funding women's facilities were overlooked or even under-looked. "...the downsized facilities for women is not due to Islam - practical reasons such as cost, poor planning and decision making on the part of mosque committees are behind this issue." So Yahya admits that non Westernized Muslims, who came from MUSLIM countries, could not afford and either poorly planned, or did not plan at all for female worshipers. And it is only the westernized children of these non western influenced Muslims who are in his words " slowly helping to improve the facilities for sisters "
So there you have it folks, Muslims who were not influenced by western values, could not afford, did not plan, and made poor decisions when it came to female worshipers of allah. However the Muslims that have been influenced by western values are only "SLOWLY" changing the plight of the poor female worshipers of allah. I just emailed the journalist to explain why women are segregated behind men, and I also posted a comment on her YouTube video about the hijab. Hopefully her eyes will be opened to the disgusting nature of Islam. Unlike Churches which serve more as places for women to show off their goods and social gatherings than any real kind of worship, Masjids are primarily for the observance of the ritualistic salat prayers which are enjoyed upon men to perform in 'jama'at (congragational mandatory prayer). Women on the other hand are encouraged to pray at home and recive a higher reward for doing so. Unlike Churches, Masjids are not places for social gatherings per say. Rather, they are places of devout worship as they were in the times of Moses and Jesus (peace be upon them) What do you think those Prophets would say to the idea of women and gay Pastors and Ministers of Christianity today. Most Churches of today, which appear to be 'Jezebel pagents' totally differe from the Synagogues in the times of Christ. Unlike Churches which serve more as places for women to show off their goods and social gatherings than any real kind of worship, Masjids are primarily for the observance of the ritualistic salat prayers which are enjoyed upon men to perform in 'jama'at. Women on the other hand are encouraged to pray at home and receive a higher reward for doing so. 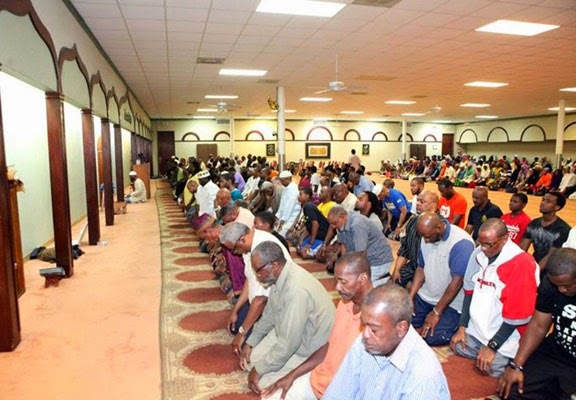 Unlike Churches, Masjids are not places for social gatherings per say. Rather, they are places of devout worship as they were in the times of Moses and Jesus (Peace be upon them). What do you think those Prophets would say to the idea of women and gay Pastors and Ministers of Christianity today. Trying to compare the function of the two--Masjids with Churches--is like comparing apples to oranges. you have written an essay, very good, you wrote what you think. Now let me ask you some questions; hope you will answer them. 1- Where is the source of Quaran? 2- Did Allah reveal his name? 3- Did Mohammed have his Circumcision according to Law? if yes, where is it in the Quaran? 4- Did Ishmael have his Circumcision according to law? if yes, where is it in the Quaran? 5- did Mohammed speak SATANIC VERSES? yes, he did. 6- What new/better things Quaran offers to mankind, which had had not been offered in the Holy Bible? 7- How Quaran supersedes Holy Bible? 8- What are the merits of Mohammed, over other earlier God sent Prophet? 9- Why Mohammed could not identify Angel Gabriel in the first place? 10-Who told Mohammed it could be Angel Gabriel? We will continue with this when you answer the above, and decide WHETHER QUARAN, MOHAMMED, ISLAM AND ALLAH ARE LEGITIMATE OR NOT.